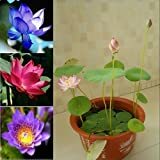 Water lily for sale is in the form of tuber planted in pots placed beneath the water. 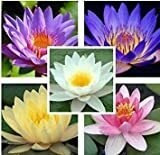 This plant is a good choice for beginning gardeners as water lilies are dependable and easy to plant. They usually blossom in the morning with star-shaped flowers and close after sunset, lasting 3 or 4 days before sinking beneath the surface. Blooming season lasts from spring to fall and water lilies go dormant in the winter. Container – Select a container that is wide and shallow for your water lily since the tuber grows horizontally. The said container may or may not have holes. In case there are holes, you may line the pot with burlap to keep the soil in the container. Leaching soil can cloud the water in your pond. to 3 inches of silt, loam or clay soil and mix in a small amount of slow-release fertilizer labeled for use with aquatic soil. In case there are fishes in the pond, you may choose to use a heavy soil that is intended for use in the garden without any organic matter as this could promote algae growth. Do not use a fluffy potting soil because it will float out of the container. Avoid soil mixes with perlite, vermiculite or peat. You may enrich the soil with aquatic fertilizer pellets. Push them into the soil before planting. Planting – Before planting the tuber, remove old leaves and thick fleshy old roots. Only emerging leaves and buds as well as new, hair-like roots should be left. Place the tuber against the side of the pot with the growing tip pointing upward in about 45 degrees. Cover the soil with a layer of pea gravel or rock to keep the soil in the pot. Set the base of the pot 12 – 18 inches deep into the pond at an angle to allow air to escape. The leaves will then float to the surface. Water – Your water lily requires a water temperature above 70 degrees Fahrenheit. If the water is not warm, your water lily will refuse to bloom. Remove them from the pond if it freezes solid in the winter. Otherwise, simply lower the plant to the deepest part of the pond where it will not freeze. Keep the water well-oxygenated with fountains, waterfalls, or aerators. Remember not to over fertilize the plants as it will turn the pond water green because of algae. Storing – During the winter season, store the entire pot containing your water lily by keeping it cool and moist inside a plastic bag. If the pot is too big, you may remove and clean the growing tuber. Store it in peat moss at 40 – 50 degrees Fahrenheit. Bring the pot back to proper growing level when the water is no longer frozen or repot like a new plant in the spring.